Jabra, a brand of GN Netcom and subsidiary of GN Store Nord A/S (GN), today made a new series of portable speakers available through its channel partners and Amazon.com: the Jabra Speak 510 Series. With two variants — the Speak 510+ and the Speak 510 — this product series offers a high degree of flexibility in the workplace and on the go. The primary difference between the two models is wiring: the Speak 510 functions as a corded speakerphone for softphones, while providing Bluetooth capability for smartphones and tablets; the Speak 510+, instead of a cord, includes a dongle that enables wireless use with softphones from up to 300 feet away. Both models are rated as being able to provide 15 hours of talk time between charges. Building on the success of the well-received Jabra Speak 410, the Speak 510 series is capable of connecting to multiple Bluetooth devices and can seamlessly switch between them. A lightweight, compact design along with an included travel case offers true mobile freedom. "The mobile workforce is growing at a rapid rate, and its workers demand technology that enables them to become more efficient at collaborating and communicating," said Pete Fox, president of Jabra North America, in a statement. 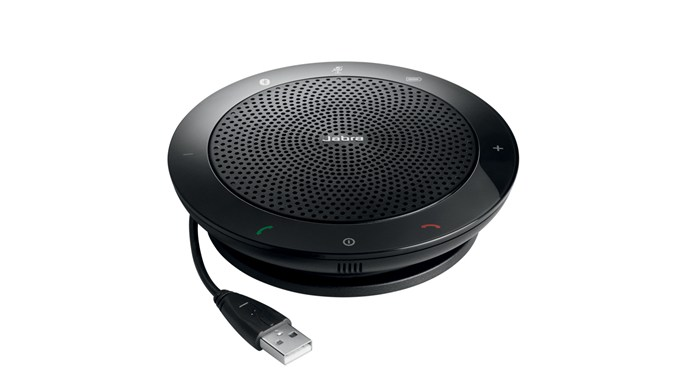 "The Jabra Speak 510 makes it easier than ever to turn any workspace into a conference room, taking 'mobile worker' to the next level." An omni-directional microphone allows all parties using the Speak 510 or 510+ to be heard clearly, making it an ideal collaboration tool, while high speaker quality ensures call participants on the other end of the line are also heard clearly. Earlier in January, Jabra launched the PRO 930, an entry-level wireless headset designed for use with telephony services such as Skype. Though wireless by design, the PRO 930 comes included with a USB cable for charging and syncing with computers.